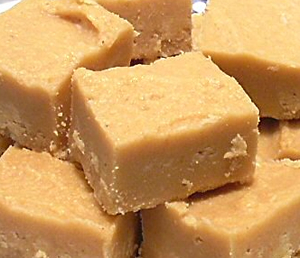 In honor of National Fudge Day, here is ANOTHER delicious fudge recipe! Combine the butter and peanut butter in a 4-quart microwave-safe bowl and cover with plastic wrap. Add the vanilla and powdered sugar to the peanut butter mixture and stir to combine with a wooden spoon. The mixture will become hard to stir and lose its sheen. Spread into a buttered 8 by 8-inch pan lined with parchment paper. Fold the excess parchment paper so it covers the surface of the fudge and refrigerate until cool, about 2 hours. Cut into 1-inch pieces and store in an airtight container at room temperature for up to a week. Holy snap! 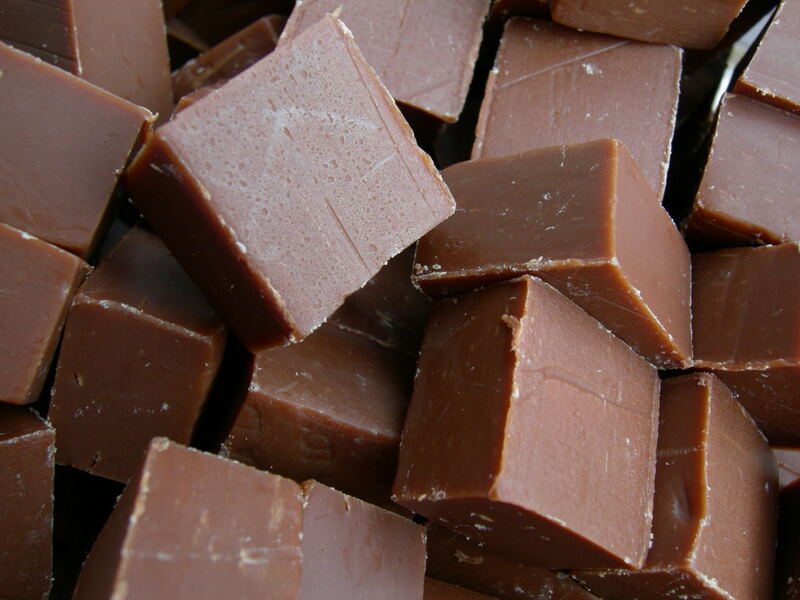 It’s National Fudge Day!! WOOOO! I was going to make some rice krispie treats today but maybe I’ll make fudge instead…or both. Probably both. Thanks to Gluten Free on a Shoe String for this delicious recipe! Seriously! Line an 8 inch square baking pan with crisscrossed sheets of parchment paper that overhang the sides. In a medium saucepan over medium-high heat, bring the coconut milk and sugar to a boil. Continue to boil, stirring constantly, until the mixture is reduced by about half, and the milk is thick and has begun to turn light amber in color as the sugars begin to caramelize (about 10 minutes of constant stirring). While it is reducing, the milk will bubble quite a lot, but will not overflow as long as you keep stirring. Once it is done, remove the pan from the heat. Add the chocolate, vanilla and salt to the saucepan, and stir vigorously until the chocolate is melted and the mixture is smooth. Add the peanut butter to the mixture, and stir until well-combined. Pour the fudge into the prepared pan and shake until the fudge is spread evenly and bang the pan flat on the table a couple times to ensure that there are no trapped air bubbles. Place the pan in the refrigerator and chill until set, at least 2 hours and up to overnight. Once the fudge seems to be set, remove it from the pan using the overhanging sheets of parchment paper and slice it with a large wet knife into 16 pieces. 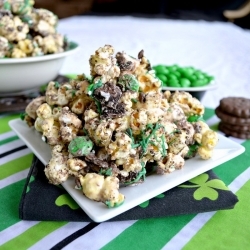 Fudge Mint Popcorn is the perfect St. Patrick’s Day snack for any party you may be throwing! 1 1/2 cup Mint Chocolate Chip Cookies, chopped & divided – check out my recipe for Mint Chocolate Chip Cookies! Combine popcorn, marshmallows, 1/2 cup chocolate candies, and 1 cup mint chocolate chip cookies pieces in a large bowl. Crush the extra 1/2 cup cookies into crumbs and set aside with the extra chocolate candies. In a microwave safe bowl, combine the white chips and shortening. Heat slowly, stirring every 30 seconds until melted. Pour over popcorn mixture and toss until everything is coated. Spread out on a wax paper lined cookie tray. Sprinkle with the crushed cookies and the extra 1/4 cup chocolate candies. Let set. Heat the green candy melts in a microwave safe bowl. Spoon into a plastic bag and cut the tip off one corner. Drizzle over the popcorn and top with sprinkles. Let set before eating. MMMM! If you want an EXTRA pop of green – color your popped popcorn with green food coloring before combining with marshmallows!